I repeat – it didn’t rain here. Not a drop. This is what we faced one morning a few years ago when we planned a trip into the Paiute Wilderness in northwestern Arizona. 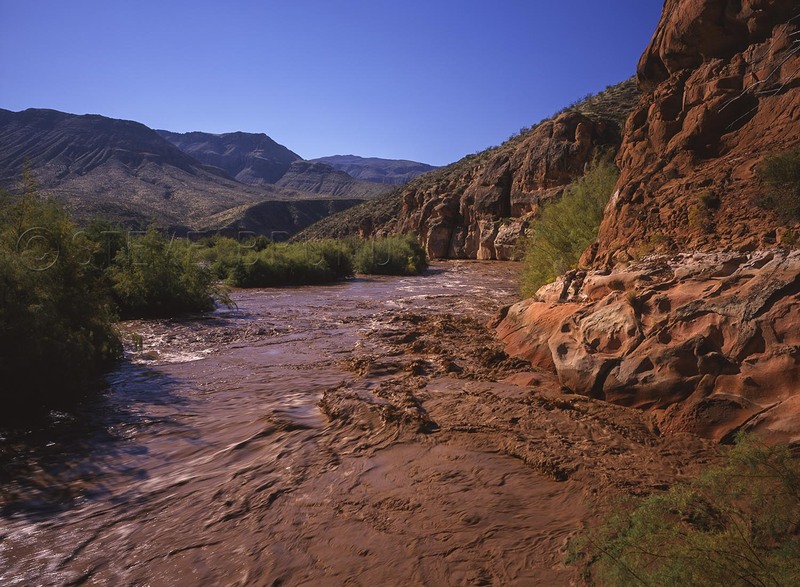 During the majority of the year, the water of the Virgin River would be mostly clear and about ankle to calf deep here. In the parts where the river channel narrows to the length of your average rental car, it is still only knee to thigh deep. At this point, you can certainly feel the pull of the water, yet it is not dangerous. Upon our arrival, we knew we had to scrap our plans. One single thunderstorm had dumped upon the headwaters of the river, about thirty miles away, during the course of the night. We could kick up dust here. On Monday, hikers died in a narrow slot canyon in Zion National Park, Utah. Rangers had given them a warning about potential flooding, but they can’t stop people from going unless flooding is imminent or occurring. It is up to the discretion of the visitors to proceed, and once this has happened, there is no way to warn them of changing weather. In canyon country, you have no way of knowing unless it’s directly above you. On August 14, 1997, eleven hikers perished in a flood in Antelope Canyon. A photographer friend of mine was there that day, and was one of several people pleading with the tourists not to proceed into the canyon. The tourists had already discussed the conditions, and voted to continue, but they weren’t from around here. Besides, it wasn’t raining there, either. I get it. People plan a trip and try to see as much as they can, and end up on a tight schedule. A little rain shouldn’t interfere with that, right? This is the desert, and a little rain goes a long way. Literally. Many, many miles sometimes. To see an example of what not to do in a flood, watch this video on Youtube. These are the stupidest people, and because they survived, the luckiest people you might ever come across. I wanted to give them credit for making a wise decision when they seek higher ground in the earlier portion of the video, but then they resume when the rain seems to let up. Tell me you’re not scratching your head by the end of this video thinking what are these people doing? That’s the danger of going into unfamiliar territory! There’s always potential danger somewhere, but staying out of a flood seems so easily avoidable. There are so many days when it’s not raining here, it makes sense to wait it out for a day.